Wow. This book had me hooked from the beginning. First what an interesting setting with this game people have to play and then all the mystery and suspense. It was SO good. With each chapter my mind was trying to figure out who the murderer was. I loved the way the book was set up. You are getting three points of view and the pieces come together at different times and you know something one character doesn’t no yet. I just wanted to get all of the pieces put together so I could figure it out. If you enjoy suspense you will love this book. Sam Sanderson is an independent, resourceful, high-tech cheerleader. She dreams of becoming an award-winning journalist like her mother, and so she’s always looking for articles she can publish in her middle-school paper (where she secretly hopes to become editor). And with a police officer for a father, Sam is in no short supply for writing material. It seemed like the perfect opportunity. When an explosive device is found in the local theater, Sam gets the lead on this developing and controversial story—controversial because the movie theater has recently come under attack by a renowned, outspoken atheist for allowing a local church to show Christian movies. Sam’s police-officer father happens to be heading the investigation, and Sam can’t resist doing some sleuthing of her own with the help of her best friend Makayla’s techno-genius. But when Sam’s theories end up being printed in the school paper, she lands in big trouble—and danger! What if getting to the bottom of a mystery means learning how to love your enemy? But when Nikki becomes victim of a string of attacks, Sam takes it upon herself and uses her super sleuth abilities to get to the bottom of the bullying. After all, articles on bullying are just what the school paper needs instead of all that silly fluff like popularity tips. 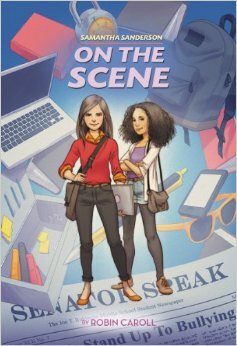 Samantha enlists the help of her tech-savvy BFF, Makayla, but while the two track down clues, they leave a trail of trouble behind—and may even be directly responsible for the break-in of their very own school’s computer lab! Samantha Sanderson is a resourceful seventh grader with the extraordinary dream to become an aspiring award-winning journalist. Sam and her best friend, Makayla, are always sniffing out the next big mystery to report in the school paper—that is, when they aren’t busy navigating the crazy world of middle school, faith, and friends. 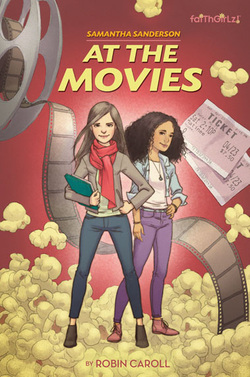 I only had the chance to read At the Movies, but if the second book is anything like the first I am sure I would recommend this one to your daughter. I would put this in the ages of 9-11 year olds. At the Movies was a great read with strong Christian tweens who have to deal with bullies and learning to stay strong in their faith. Samantha is a strong-headed girl (like a lot of tweens) and she loves writing for the school paper. She is very gifted in this area but has to learn to deal with the “rules” of writing and covering a story, one that her father is leading the investigation . I am sure most tween girls can relate to the characters in this book and be encouraged as they read about other Christian tweens and how they handle some tough situations. Grab a copy at your local bookstore, Amazon, Barnes and Noble, Christianbook.com or Books-A-Million.